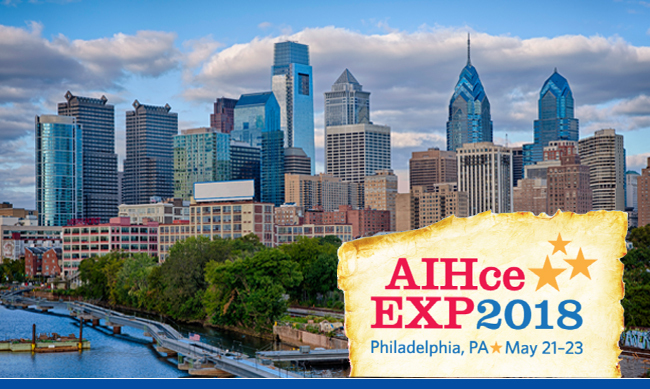 The 2018 American Industrial Hygiene Conference & Exhibition is almost here. This year’s conference is May 21st through 23rd in Philadelphia, Pennsylvania. C&IH will be presenting on various pertinent issues described below. We hope you will join us! Industrial hygiene professionals have to be aware of the most up-to-date risk assessment methods and techniques. This PDC will take participants for an intensive ride! We will begin by reviewing the basics and methodology of risk assessment related to typical hazards industrial hygienists face. Structural components of the risk assessment paradigm (hazard identification, exposure assessment, dose-response assessment, and risk characterization) will be reviewed from a practical point of view. The methodology of risk characterization will be discussed, and risk calculation tools will be provided, along with practical exercises proposed to test the models in real-life applications. Participants will learn how to apply risk calculation methods and models to evaluate probabilities of disease in exposed cohorts and populations. B3: Air Dispersion Modeling for IHs: Should You Be Using Modeling? Air dispersion modeling of indoor and outdoor exposures is a rapidly developing area of industrial/occupational hygiene. Air dispersion modeling has numerous benefits for exposure assessment. Knowing why and when to use these models can be as much an art as a science. This presentation will provide participants with modeling-related perspectives, success stories, problems, and limitations, to assist them in determining whether modeling is appropriate for their situation. Selected models (box, two-zone, AERMOD, CALPUFF, ALOHA, CONTAM, and CFD) will be summarized and discussed. After many decades of asbestos toxicological studies, probably no one would question the fact about asbestos fibers being carcinogenic in humans. The session will open up a fascinating area of asbestos studies where mode and mechanisms of action for these fibers are still under active exploration. In particular, the autoimmune theory for asbestos toxicity will be presented. Different fibers have different health outcomes. For example, pleural disease, a biomarker of asbestos exposure, may become progressive in the presence of certain autoantibodies. An innovative model of asbestos mesothelioma potency will be proposed. Its implications for fibers with limited/absent epidemiological information will be demonstrated. This education session builds on a previous study and a 2014 publication in Inhalation Toxicology entitled, “Cumulative Retrospective Exposure Assessment (REA) as a Predictor of Amphibole Asbestos Lung Burden…” This session focuses on household exposures where take-home from occupational activities is presumed to be the only potential exposure source for other household members. Three CIH raters independently performed REA and two pathologists performed lung digestion analyses. We found that estimated Household Exposure was in the range of 0.2% to 4% of the estimated Occupational Exposure. Erionite, one of the most enigmatic minerals around, seems to be a potent mesothelial carcinogen. For IHs dealing with mining, construction, and community protection, it is vital to understand the basics of erionite fibers. This session will offer information on the campaign to sample for erionite in the village of Karain, Cappadocia, Turkey. “What if” scenarios will be used to evaluate community and worker exposure risks. Several difficulties with erionite laboratory analysis will be outlined and approaches to improve the quality and reproducibility of laboratory tests explained. Possible IH algorithms of recognizing and dealing with erionite hazards will be outlined. The session will introduce the audience to the one of its key, but not very publicly recognized structures: Standards Advisory Panel (SAP). The SAP’s purpose is to make prioritized recommendations regarding AIHA’s involvement in consensus standards setting activities to ensure that industrial hygiene and occupational and environmental health and safety is represented. The speakers (including the incoming chairman of SAP, Dr. Andrey Korchevskiy) will give AIHA members an opportunity to know why this panel is expected to play an even more important role for the AIHA in coming years and how the members can be involved in its activities. Risk assessment and regulation of asbestos minerals seem to be even more important, especially with new discoveries regarding naturally occurring asbestos (NOA). But which minerals would actually fall under the definition of asbestos? Initially in the US, six minerals were classified as “asbestos.” However, the US EPA currently uses a term “Libby amphibole asbestos” in relation to the mix of various amphibole minerals. Should we gradually explore opportunities to change the definition of asbestos itself? What would it take to set up more flexible and mineral-specific reference concentrations and risk levels? Can fine mineral fibers, a hazardous air pollutant listed under Section 112(b) of the Clean Air Act, finally be regulated in these situations? This session will discuss risk assessment, epidemiology, and regulatory aspects.